Though Apple leads sales in that market segment, its position has fallen considerably from 2010, when the Apple Cinema Display accounted for 53.3 percent of LED LCD monitors 24 inches and up, according to new data from NPD's DisplaySearch. Nipping at Apple's heels in the big-screen LCD market is Samsung, which currently accounts for 24.3 percent of sales in that segment. Samsung's market presence in North America is up from 2010, when it had just 12.3 percent of larger computer LCDs. Samsung did best Apple in sales of LED LCDs sized 24 inches and up outside of North America, taking 34.7 percent of the global market. Apple led that market segment in 2010, but was pushed to second place by Samsung in 2011. Apple previously offered Cinema Display screens in sizes of 20 inches, 24 inches and 30 inches, but those were discontinued as Apple streamlined its product offerings. In 2010, they were replaced by one 27-inch LED Cinema Display. Last July, the product was updated and renamed the Apple Thunderbolt Display, a 27-inch LED LCD screen with Thunderbolt I/O technology and built-in docking cables for MacBooks. Any Thunderbolt-enabled Mac notebook can dock with the display to create a full-fledged desktop solution, including a built-in FaceTime HD camera, 2.1 speaker system, and a number of ports including Thunderbolt for daisy chaining up to five devices. 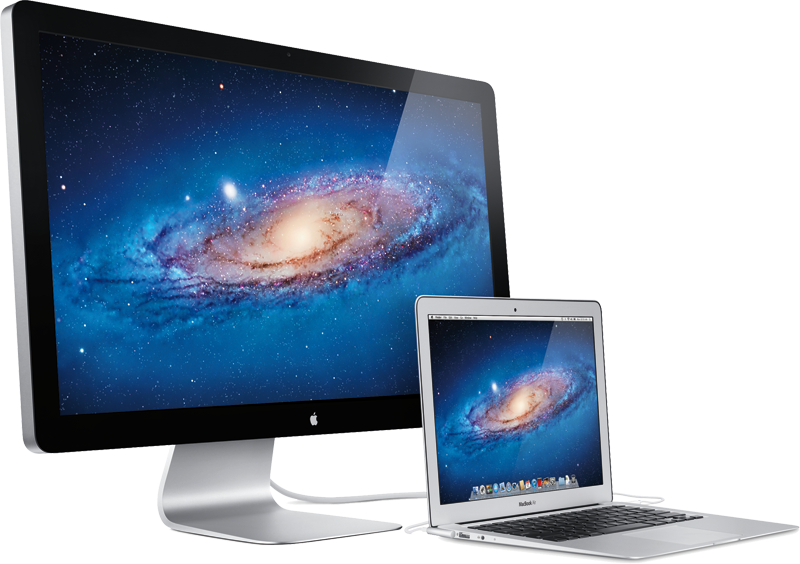 Apple also continues to offer the legacy 27-inch Cinema Display. Tuesday's report is the first major indication of how Apple's Thunderbolt Display performs against competitors in the market. Samsung is one of the world's largest LCD makers, and is the primary supplier of Retina displays for Apple's new iPad.